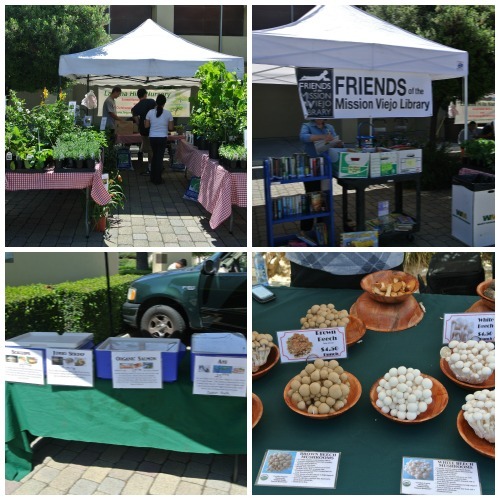 The Mission Viejo Farmers’ Market recently moved to Saturdays from 9:00am to 1:00pm – it was formerly on Friday during the same hours. The market is at 200 Civic Center Drive, in the civic center courtyard directly in front of the Mission Viejo library. I went with my son last Saturday to check out the offerings. It’s not a huge market, similar in size to Foothill Ranch, with some of the same vendors we’ve see regularly around Orange County, like Baba Foods, Chili Boys, and Rockview Farms. The big find for me at this market was Robbie’s Fresh Seafood. Their fish comes straight from fisherman to customer, caught within 24-48 hours of sale. I tried the organic salmon, which was as tender, fresh and delicious as the salesman promised it would be. There were a few other unique features to this market, including flowers and plants from Laguna Hills Nursery, a Friends of the Mission Viejo Library booth accepting donations of used books, and a cool display of locally-grown organic mushrooms. The market is not crowded and there is plenty of parking in the library lot. A quick stop on a Saturday morning and you can load up on fresh organic vegetables and seafood for dinner. This farmers’ market features live entertainment, gourmet food trucks, and goods from local artisans from time to time. 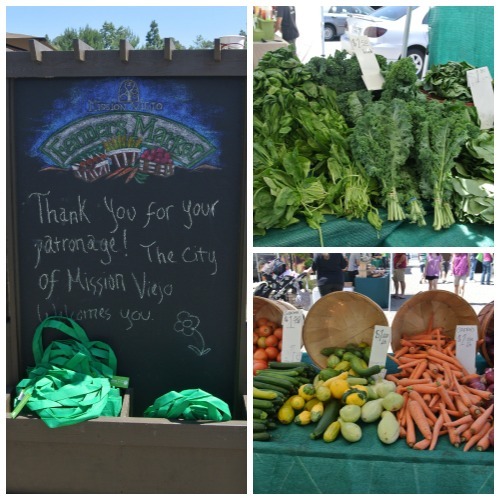 Check out the city of Mission Viejo’s farmers market page of the website for details about special events each Saturday. Posted in Farmers Markets and tagged city of mission viejo, customer, Farmer's markets, farmers markets, food, local, Mission Viejo, Orange County, organic, review. Bookmark the permalink.